Placing second in the competition last year, Malkiewicz now encourages anyone with the passion and zeal to make their business a reality to get involved in SSM, a collegiate nationwide tournament that kicked off earlier this year. In this tournament, students compete to attract potential investors for their digital media startup businesses. Students submit their ideas online to compete in one of four virtual regional competitions. Two finalists from each region are then selected to pitch their business before a group of celebrity entrepreneurs and venture capitalists at South by Southwest (SXSW), a digital media conference in Austin, Texas, that celebrates innovation in music, film and technology. Online submissions for the 2012-13 nationwide competition have been under way since the summer and regional judging has started, with the national finals in March at SXSW. SSM was created by Sean Branagan ’80, director of the Center for Digital Media Entrepreneurship, who wanted to offer a platform for college student startups to get real-life exposure in front of seasoned investors. As one who promotes practical design, strategy and real-life implementation, he thinks it’s vital to create a setting for students to receive the kind of exciting revelation they can only get from attending a dynamic conference like SXSW. “This is a program that helps students start businesses and move forward with their businesses in a professional way,” says Branagan, who currently teaches “Lean Digital Media Startups and New Media Entrepreneurship.” Students have to prove their strength of idea, technical talent and its scalability in order to be considered. 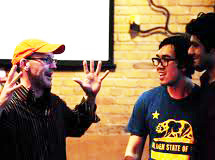 In March 2012, five college student startups, including Malkiewicz, were selected at the kick-off event to attend SXSW . Each of the student digital media entrepreneurship teams had 15 minutes to give an in-person pitch and answer questions. One of the judges was New York Angel chairman and social media investor Brian Cohen ‘76, the first investor in Pinterest. “Deals can happen immediately, or in the venue shortly after the pitch,” Branagan says. Malkiewicz placed second last year to a venture by University of Virginia students Duylam Nguyen-Ngo and Ashutosh Priyadarshy, creators of WalkBack. WalkBack is a personal safety mobile app targeting college students that helps friends sync their smart phones with one another and check each other’s safety status and location. The popularity of the first SSM at the 2012 conference generated sponsorship and student awareness, and inherently created the opportunity for more students to apply to this year’s regional competition, Branagan says. During the 2012-2013 competition year, SU is joined by three additional regional hosts: Emory University in the Southeast, St. Louis University in the Midwest and the University of Texas at Austin in the Southwest. Branagan sees himself as an instigator for this type of work and with SU’s help, he expects it will continue to grow. “Just like the NCAA is an independent tournament, Student Startup Madness will have to be as well, but we will always be able to say we started it,” he says. He reminds students that the true essence of starting anything is a journey of mistakes you learn from through each experience. “Students with ideas don’t need to second guess themselves: just dive in,” he says. Kathleen Haley contributed to this story.